Chrystia Freeland, left, will hold NAFTA meetings in the U.S. capital on Tuesday and Wednesday. WASHINGTON — Foreign Affairs Minister Chrystia Freeland emerged Tuesday from meeting U.S. trade czar Robert Lighthizer with the threat of steel tariffs and uncertainty overNAFTA hovering in the dense, humid Washington air. Freeland began her two-day visit to Washington with a two-hour, face-to-face meeting inside the office of the U.S. Trade Representative, the site of intensive North American Free Trade Agreement talks over the last several weeks. Freeland said she and Lighthizer would continue their discussion later in the day by telephone, but the clock is ticking against them. Canada's latest reprieve from potentially crippling U.S. tariffs on imports of steel and aluminum expires on Friday, and there are fears they could go into effect without a NAFTA deal in place, wreaking havoc on the continent's economy. 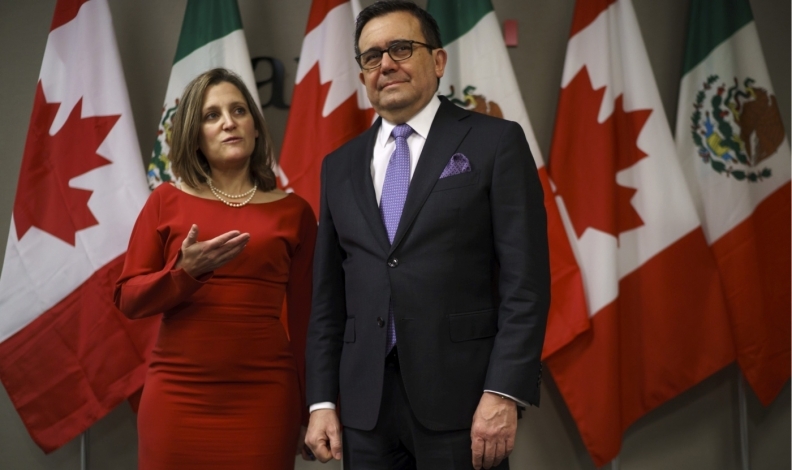 Freeland insisted the steel issue remains separate from the renegotiation of NAFTA, a deal U.S. President Donald Trump has repeatedly blasted and threatened to rip up. In the past, Freeland has said Canada wouldn't take NAFTA's demise lightly, and there will be consequences as well if Canada loses its steel and aluminum exemption on Friday, she warned. "Our government always is very ready and very prepared to respond appropriately to every action. We are always prepared and ready to defend our workers and our industry," she said. "Canadian steel workers should absolutely know that the government of Canada has their back ... we are very clear in making the point, which I think frankly is common sense, that in no way could Canadian steel and aluminum pose a national security threat to the United States." Mexico was not at Tuesday's meeting. Mexican Economy Minister Ildefonso Guajardo said last week he sees a 40 per cent chance of reaching a NAFTA deal before July 1, Mexico’s election day. Unifor President Jerry Dias, whose union represents Canadian autoworkers and others, said there are many barriers to a deal. Prime Minister Justin Trudeau has been talking by phone with Trump and Mexico's Enrique Pena Nieto in recent days, despite dwindling hope of reaching a deal on updating the continental trade pact. The three countries have been working around the clock in hopes of getting a deal in time for the current iteration of the U.S. Congress, and ahead of what's expected to be a consequential election in Mexico July 1. The rules surrounding autos remain a major sticking point, which as left stakeholders and observers alike skeptical that Freeland will be able to accomplish anything substantial during her visit. Freeland said that was a major topic of the conversation with Lighthizer on Tuesday, and remains key to cracking a complex negotiation. "The intense engagements we had both at ministerial and official level for the past several weeks is evidence of how hard everyone is working on this."